I’d been putting off cleaning out my freezer for months. It’s not one of my favorite things to do, and if it weren’t for that rock solid whole chicken that fell onto my foot, I wouldn’t have given the chaos in my freezer a second thought. But bags of vegetables, packs of meat, a bunch of leftovers and whatnot were crammed into the narrow space just waiting for the chance to strike again. After a series of creative expletives, I picked up the chicken from the floor and limped over to the counter to stash the bird while I emptied out the rest of the freezer contents. It took about ten minutes to clear things out and another twenty minutes to wipe the inside of the freezer clean. Once I got going, I still didn’t like doing it. But at least I’d tackled a long overdue task. With the freezer rotated and organized, I made a plan to revive all the leftovers that were practically forgotten. I had some grated Manchego cheese and crispy prosciutto I’d store away after writing a recipe for a contest. I thought it would go great in a tart made with the single sheet of puff pastry that had been in the freezer since New Year’s Eve. I added some asparagus to give the rich tart a little freshness. It was the perfect reward after conquering my out-of-control freezer situation. Let me know when you make this recipe. 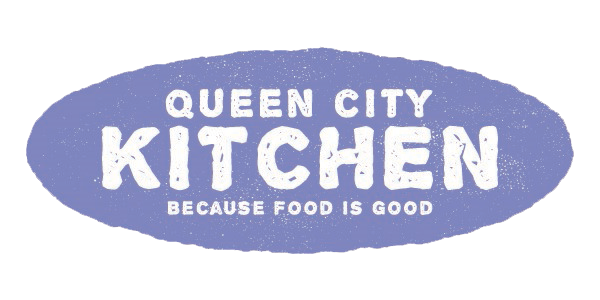 Take a picture and hashtag it #QUEENCITYKITCHEN. I can’t wait to see what you post! Preheat the oven to 400 degrees F. Line a baking sheet with parchment paper. Heat a frying pan over medium heat. Add the prosciutto slices and fry until wrinkled and crisp. Place the meat on a paper towel-lined plate to cool. Crumble the prosciutto and set aside. On a floured surface, roll the puff pastry into a 16-by-10-inch rectangle. Trim any uneven edges and transfer the pastry to a baking sheet. With a sharp knife, lightly score pastry dough 1 inch in from the edges to mark a rectangle. Pierce the dough with a fork inside of the lines at 1/2-inch intervals. Bake until golden, about 15 minutes. Remove pastry shell from oven, and sprinkle with Manchego and prosciutto. 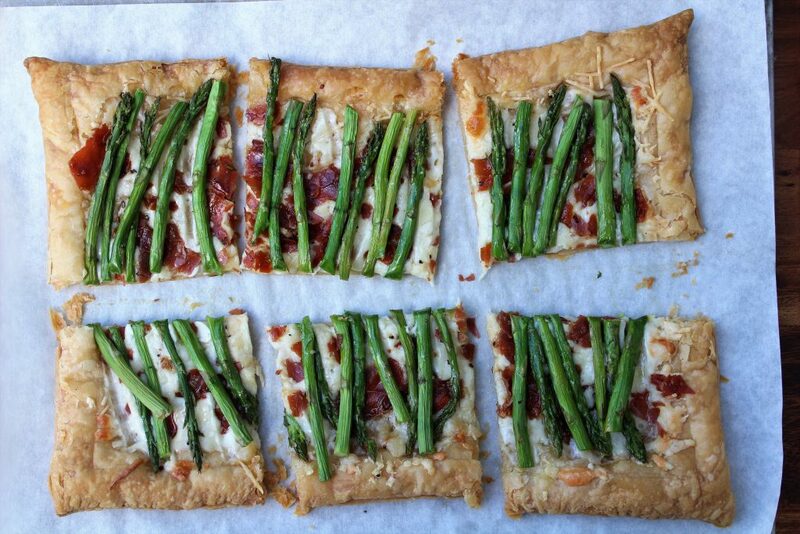 Arrange the asparagus in a single layer on the pastry, alternating ends and tips. Brush with oil, and season with salt and pepper. Bake until spears are tender, 20 to 25 minutes. 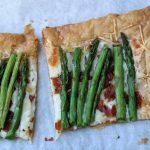 This entry was posted in Appetizers, Breakfast, Lunch, Recipes, Vegetable and tagged asparagus, Manchego cheese, prosciutto, puff pastry on April 28, 2017 by Andria Gaskins. Join my mailing list for updates, tips and contests.